I'd passed the code test, and now, a couple of weeks later, I was battling a slippery pencil for the written. When I was done, Don, WØFIT, looked over my papers before slipping them into the envelope to Gettysburg. "I'm not supposed to tell you" he said, "but let's talk about what you'll need for a transmitter and antenna..."
I had already borrowed a receiver, a BC-454-B, to listen to W1AW code practice. The receive antenna was some wire draped out the 2nd floor window of my bedroom, definitely not suitable for transmitting. The necessary considerations for a dipole antenna had already been covered in Don's theory classes. He had always thought it important to gain understanding beyond learning how to answer the FCC's questions. Several of his novice students (including me) have gone on to careers in electronics as testimony to his approach. a light bulb & socket mounted on a board and a small home-brew transmitter with crystal. even though it was called a dummy load, the light bulb DID radiate. "Wait for the mail before you power the transmitter!" The next day I cut the wire to length, threaded the insulators and carefully soldered the securely wrapped joints. Dad and I stretched the antenna across the back yard and determined where our supports would be and how much rope would be required for the task. Then I coiled it all up and stored it in the garage for another day's work. The waiting weeks cooled the urgency of the project. My receiver's aerial worked fine for listening and that's all I could do anyway, wait and listen. Saturday morning the mail came early. "Federal Communications Commission, Gettysburg, PA" was the return address. Inside the envelope, the much anticipated answer to "How'd I do?". When I was learning the Morse code, the two letters that had given me the most problems were mirror images, "P" and "X". And now fate had decided that I would become intimately familiar with both. WNØPXT was my newly minted callsign. Dad was at work this Saturday so final construction would have to await his arrival. Oh, how I was wishing now that we had completed this project sooner. But all I could do was begin the process by carefully unrolling the wire in the back yard and stringing the feed line to my bedroom window. That didn't take all that long and the waiting became excruciating. Finally, with little time before dark, Dad came home and we began mounting pulleys and rope to hang the antenna from the selected supports. As the light faded, only one end of the wire was airborne. The other would wait until tomorrow. I hid my disappointment as best I could as I climbed the stairs to my room to do a little listening. I could now use the transmitter even if it was only connected to the light bulb dummy load! turned it on and carefully fitted the 3735 kc. crystal to its socket. After waiting several minutes for the bottles to warm, I tapped the key and heard a "beep" from the receiver. After a bit of tuning, I sent my call for the first time, W…N…Ø…P…X…T. I repeated it over and over as the strange letters became more and more familiar. After several minutes of "dah, dit, dididit, dah" and repeating my callsign, I paused to consider what to do next. It was then, in my headphones, that I heard an echo of my new identity, "WNØPXT…WNØPXT… WNØPXT…DE… ". Someone had actually heard the signal from the dummy load and was calling ME! I sat in stunned silence as the echo returned, "WNØPXT…DE…WAØMQJ…WAØMQJ…WAØMQJ K". Got it this time. I gathered myself and sent him a signal report, 589, and "OP BOB QTH ALBERT LEA, MN"
and he replied "UR RST 599 599, OP JIM JIM IN ALBERT LEA ALSO". 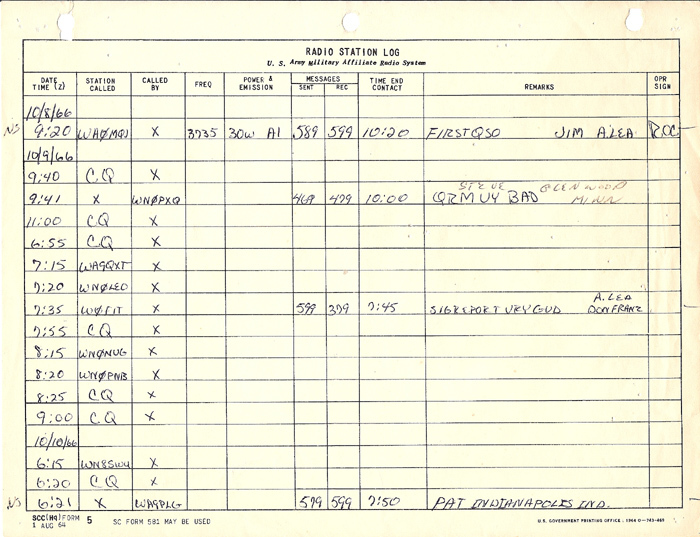 "10/8/66 9:20(pm CDT) WAØMQJ 3735 30W A1 589 599 10:20 FIRST QSO JIM A'LEA ROC"